or use the questionnaire at the bottom of this page. is not available, but a MOVIE is ready to be seen. (4) Automatically adjust the damper opening by detecting the weight increasing speed. SARTORIUS Accuracy - Sartorius Ultramicro/Micro Balance is utilized!! Pharmaceuticals, electro ceramics, batteries, chemicals, etc. (1) Can disintegrate agglomerated Nano particles (50 - 1000 nano meter diameter) into single ones and spray them on a flat space under a dispersed condition. (2) Nano particles can be dispersed by friction charging, going through a small metal pipe. (3) By monitoring the charge level at the pipe in-line, feed back control is possible. (4) Dispersing/spraying time is shortened by this newly developed continuous system (not batch type). 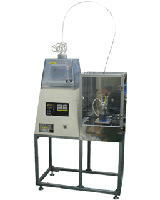 Electronics, dry dispersing on film, glass, silicon wafers, etc. (1) Bridge or segregation of materials is prevented. (2) Mass flow and uniform-rate feeding are realized. (4) Very difficult-to-handle materials can be now dischargeable. Wood chip, ultra-fine powder, battery material, ceramics, etc. Wood chip, feed, soy bean meal, fish meal, DDGS, wheat bran, mids, etc. (1) TAPCO has the largest inventory of elevator buckets and bolts in North America. grains, food, feed, wheat flour, etc. >>>> Questionnaire for unique powder handling equipment is as follows. Questionnaire form can be displayed by turning on Java Script.